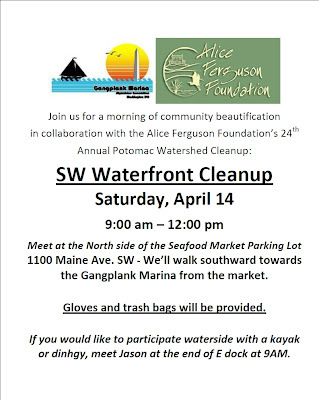 Gangplank Slipholders Association (GPSA): Make this Saturday a DC Waterfront Day! Make this Saturday a DC Waterfront Day! If you haven't been down to the SW Waterfront recently, be sure to stop by on Saturday. In fact, why not make Saturday a DC Waterfront Day? The weather should be absolutely gorgeous the entire day. Come to the Southwest Waterfront in the morning to help with our AFF cleanup site (9AM-noon). Head across the river to Anacostia to check out the launch party for the must-see Lumen8Anacostia, a noon to midnight festival of light, art, music and fun! 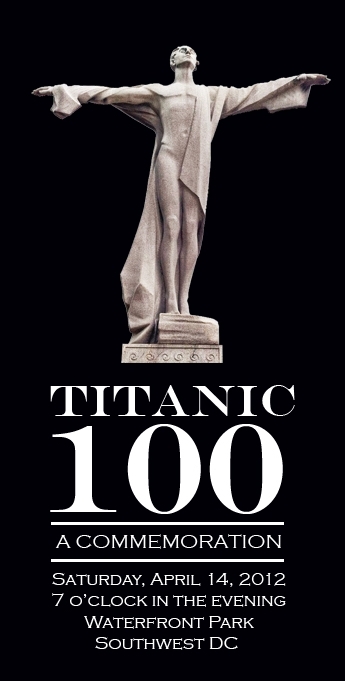 However you choose to enjoy DC's Waterfront communities today, be sure you have plenty of time to make your way back to the SW Waterfront around 7PM to attend the Titanic 100 Commemoration! Looking for a unique form of transportation to enjoy your DC Waterfront? Consider using American River Taxi for your water commute! Below are some additional details on our SW Waterfront AFF Cleanup site and the Titanic 100 Commemoration. We look forward to seeing you on Saturday! 1,517 luminaries will line both sides of the Southwest Waterfront Promenade, each bearing the name of a passenger and crew member lost in the disaster. Period music will be played throughout the event. At 9:00PM, a brass ensemble will present a live performance of "Nearer My G-d to Thee," the last song played by the ship’s musicians as the Titanic sank beneath the sea. There will be no speeches. The Southwest Community sees this as an opportunity for those who have been moved by the story of the Titanic to gather together and – at the waters edge -- be immersed in one of the most enduringly fascinating and epic events in maritime history. HOW TO GET THERE: The Titanic Memorial is a 5 minute walk from Metro's Waterfront Station. The Titanic Memorial is located at the Promenade Park at 4th and P Streets, SW.